Here at work, we often spend lunch times looking for pictures of obscure and unlikely looking racing cars on the internet (the Hurst Floor Shift Special anyone? ), and try to find out a bit of history about them – this is often as unlikely as the cars themselves. A Championship that was popular for a while in the mid 70’s was called “Supersaloons”. As a result, rear engine cars became the most popular allowing a mid engine entry. This quickly developed into former single seater race cars like Ex Formula 1 (not as expensive a proposition as this would be today) and Formula 5000’s being used with simple lightweight GRP shells mounted over the top of them. Racing together were Imp’s, Skoda’s, and the odd Beetle, but the ones that are of most interest to us here are the VW1600 Fastbacks! The car was built by Colin Wilson who raced it to championship winning success in 76 and 77. Here it is in the paddock at Brands Hatch around that time. Note the bonnet treatment which cleverly retains the silhouette of the original, but lowers the front to improve the aerodynamics – nice! Interestingly the car it was based on was the Gordon Murray designed (He of Brabham F1 and later Mclaren Road Car fame), Alan de Cadenet (Amanda’s Dad for the FHM / Loaded readers amongst you ) entered “Duckhams Special” which had achieved 12th place in the 1972 Le Mans 24hr race. As an aside, Colin’s long time sponsor the Toleman Group, entered Formula 1 as a constructor in their own right in 1981, and in 1984 gave a young Brazilian driver by the name of Ayton Senna his start in F1. They were bought by the Benetton in 86 who were then more recently bought by Renault. The car was sold to Walter Robinson in early 78 who modified it as it’s seen here at Croft in “high downforce” mode. Let me transport you a few years further back in time and to the other side of the world, to meet Australian Bryan Thompson. Bryan’s first love had always been motor racing. On Motorcycles at first and then in cars as soon as he could afford to. He quickly progressed through Mini Coopers and on to the American Muscle cars that were popular in touring car racing in the early 70’s. As Touring cars got more professional and expensive our man Bryan looked toward the new “Sports Sedan Series” with it’s $100,000 prize fund, and built a Type 3 with Chevy V8 power to contest it. Here we see Bryan and the car in action at Calder in 1974. 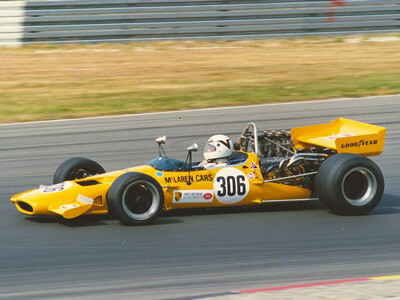 The running gear came straight off a Mclaren M10B F5000 car, which was a powerful car in it's day - more powerful than the F1 cars at the time, so keeping the VW on the track must have been an effort in itself. The car made Bryan a bit of a celebrity. The crowds loved the sight of the under dog beating the established stars in an unconventional and wild VW! In fact Bryan came close to taking the Championship. Leading it by a point and going into the last race, all he had to do was finish in front of his nearest rival to take the honours. Unfortunately he suffered an engine failure on the last lap while in the lead. He smoked his way to the finish, but lost the race and so the championship – a cruel blow. Somewhat disappointed by all this, he collapsed and promptly retired directly afterwards. He later returned to competition taking the 1986 Australian GT Championship in a Toyota Supra, and thus finally achieving his long overdue success. "But what about the car" I hear you cry? Well… I think this picture of Bryan and the Fastback kind of draws a line under the whole episode.